Hello fellow humans! Nice to make your acquaintance. I can’t wait to update everyone on my past week. However, first I must begin by telling you all that I got back from Poland about a week ago. It was an intense experience, but no worries I will try to communicate my feelings and the horrors to the best of my ability. These will be in an essay that I am writing for Jewish history. On a lighter note, the past week has been chock full of wonderful times and activities. We had Sunday off since we got back to the Kibbutz at the ripe ole time of 5 am. Also, let me tell ya there is nothing like coming back to a home as amazing as Israel after a lengthy and draining trip. Then, we had school for a couple days, but even school in Israel is a billion times better than school in the US. We two trips last week, which include a tiyul (trip) to the north and to Tel Aviv. We went to the Kinneret aka the Sea of Galilee. It's so beautiful there. During this tiyul, we went to the first Kibbutz in Israel, which was established in 1909 (my mom and dad may remember that) (lol because they are old), it was very interesting to see all the hard work and struggles that people went through in order to create this settlement. We also got a super beautiful view over the yam (sea). Do my Hebrew skills impress you yet? 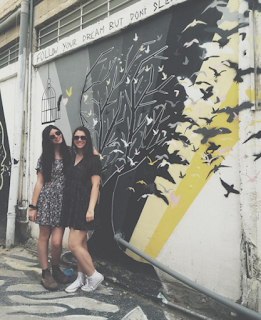 Another tiyul we went on was to Tel Aviv!!! Yay, it was super, super fun. My Jewish history teacher is a certified tour guide (he also has a secular wife) (that needed to be included because everyone on EIE with me will get the joke). He took us on a graffiti tour in his neighborhood, so he basically knew it like the back of his hand. He lives in a "super hipstery" (his words) part of Tel Aviv called Florentine. The graffiti encasing the neighborhood ranges from artwork belongs in a museum to a pre-schooler trying to write their name for the first time. Regardless, the whole place has a ton of personality and seems to be an amazing place to live. We also got some free time to walk around Tel Aviv by ourselves (woot, woot!!). It is so amazing to experience the rush to complete the shopping for Shabbat and be in the shuk (the market) while this is taking place. Everything about it just intensifies the love I have for being here because there is just something different in the air. I will not be able to feel that once I get home. We ended our week with a Shabbat service themed around friendship, which just seems so fitting. Some miscellaneous things that I would like to include are EIE is halfway over :-( . I love it here (if you were not aware yet). My friends here are amazing. I am just learning so much all the time. This upcoming week we are going on two more tiyuls; one to Tel Aviv and one to Jerusalem to see a jail (????). These are supposed to be super fun and interesting. Also, MY BIRTHDAY IS TODAY!!!! WOOHOO! That's about it for now, catch ya on the flip side!